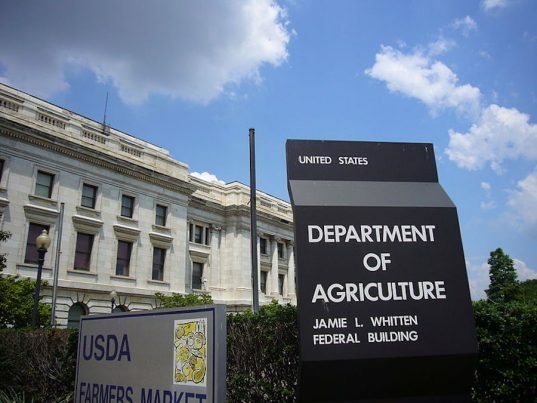 In other words, the United States Department of Agriculture’s NIFA program will be helping minorities achieve their goals in the agricultural sciences but not white people. NIFA claims that developing a diverse talent pool is absolutely essential, but why is someone’s race even a factor at all? We live in the most generous and opportunistic country on the face of the earth, and anyone can follow whichever career path they choose to follow regardless of external factors like skin color. Why do minorities need a special program and additional funding to get a job when non-minorities have to rely on talent and skill level alone? Furthermore, why must we constantly look for ways to “balance out” the number of whites and blacks in every single American institution, from college campuses, to the movie industry, to positions within the federal government? It would be nice if for once our country could look past race and instead solely focus on the characteristics and qualifications of a person rather than on the color of their skin. Needless to say, that would be the fairest way to go about running the country. But as they have demonstrated time and time again, the liberals only care about things like fairness and equality when they are fighting for those they consider to be “victims” – i.e. blacks, gays, women, etc. Furthermore, the left would much rather see a system of nationwide affirmative action put in place rather than a system that is colorblind. They would much rather give special treatment to some in the name of “diversity” than treat everybody the same, regardless of things like gender and skin color. That is a reality that they will never even come close to admitting, but it is absolutely true nonetheless. To give another example of how leftists give special treatment to some but not to others based on race, earlier this month, Campus Reform reported on how the National Science Foundation is planning on issuing 27 new grants and spend a total of $8 million to promote “diversity and inclusion” in STEM fields. Most of these grants, which will be funded by the taxpayer, were specifically created to attract racial minorities. Indeed, this new affirmative action program being promoted by the National Science Foundation is similar to The USDA’s Multicultural Scholars Program in that it intentionally favors one race over another. The fact of the matter is that everybody should be given an equal chance, and nobody should be given special treatment. The late Martin Luther King Jr. made it very clear that he envisioned a country where people are judged based on the content of their character, not on the color of their skin. By specifically targeting people for recruitment based solely on the fact that they are minorities, isn’t the U.S. Department of Agriculture and the National Institute of Food and Agriculture doing the exact opposite? If you take a step back and pay close attention to the state of our country right now, it really is sad how obsessed we have become with race, though particularly those on the left. Every single time you turn on CNN or MSNBC, they have at least one panelist who just can’t help but bring up skin color and how “oppressive” the system is towards minorities. When you go to the movies, chances are you won’t be able to make it through the entire film without being forced to see one or two references to race. College campuses are replete with posters, signs and special programs to remind students of just how important diversity is. We have become a society that is more focused on skin pigmentation than we are on skills, talents and motivation, and it is only going to get worse as the years go by.